I was once told "Get in over your head, and then swim to the top." 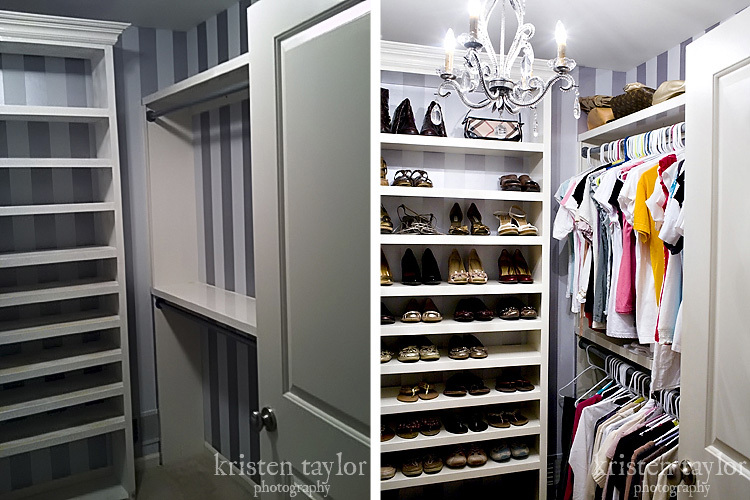 Well, I am pretty sure that the person who told me this never tried to design and build their own custom closet with their own two hands! So this all started one Monday a few weeks ago (Monday's are generally my day off since I shoot on the weekends). I wasn't sure what I was going to do with the day, but I knew I needed to put my clothes away which had piled up in the laundry room. 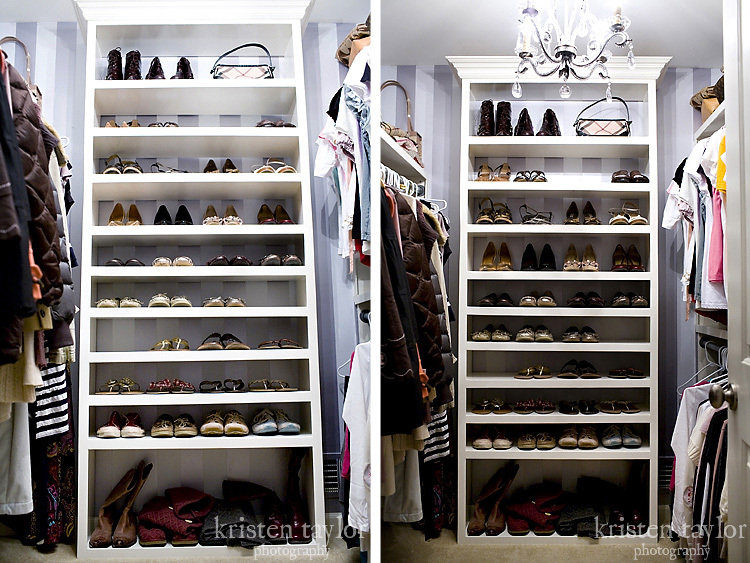 I wasn't very excited to do it, and I thought "hmmm... it would be a lot more fun to put my clothes away if I actually liked my closet, like if it wasn't painted an icky gold color in chalky dry builders-grade paint." So I decided to spend the day painting my 6'x8' walk-in closet. I took everything out and put it ALL over our bedroom, which I didn't think was a problem because I had every intention of wrapping up this little project by the time my husband came home from work that evening. Painting a room in our house within a day is a pretty normal thing for me to do. Well, after removing my clothes from the closet, I realized I wasn't terribly thrilled with the cheap wire shelving that was in there, so I ripped it all out... which then meant that I had about 40 screw holes to patch. This was about the time that my husband came home, and he just looked at me and the insanely huge mess of my clothes in our bedroom, and said "wow, you are SO in over your head... and at that point I sadly knew he was right." But at this point there were no longer any shelves in my closet so there wasn't really an option to turn back, so I decided that I was going for it, and that if I was going to do it, I was going to make it AWESOME!!! 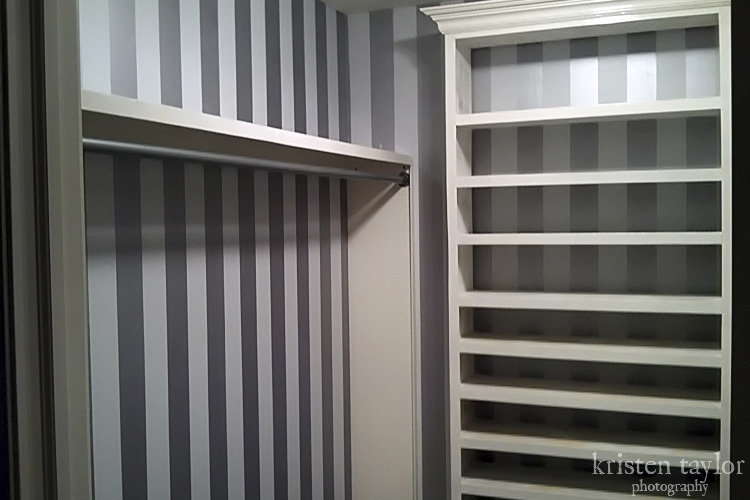 So then I not only painted the walls, I did it in stripes with a metallic paint. 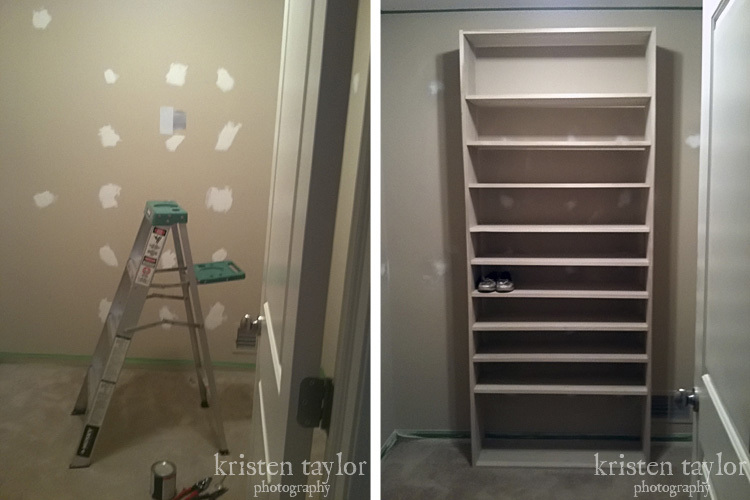 And I built all of the shelves, including a giant shoe tower topped with crown moulding, by hand from raw wood... which meant tons of sanding, painting, etc. And of course, as the final touch, I hung a beautiful chandelier. It was a HUGE endeavor, and it took me many many of my days off to get it done... but I am thrilled with how it turned out. Now that it is done I can say that it was totally worth it... although I won't be embarking on another project like this for a very very long time!!! So here are some before and after photos. Some were taken with my iphone, so please forgive the low quality of some of them.